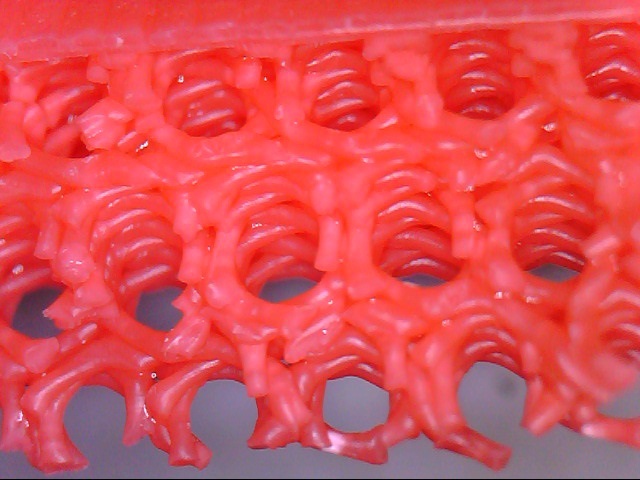 I have a red 3d printed plastic disc and I know that it is solid red inside and out, even I cut or melt it. So it seems odd to me that it would turn white when I bend it. What’s going on here? Plastics can fail in one of two ways: Their molecules can quickly slide relative to each other without stretching in a process called shear yielding. This leaves behind a clean cut face and a hardened surface, but does not result in a whitened region. The failure mode we are interested in here is called crazing. This occurs as a localized deformation that leads to the creation of voids and alignment of the molecular chains. Any area affected by crazing has undergone permanent deformation and will not move back to its original position when the load is released. The result is a highly strained area that permanently appears white. Shown at 500x on SEM microscope. When light hits the surface of anything it must be absorbed, penetrate through, and/or be reflected. The sum of all wavelengths reflected is what we see. Natural plastics are often whitish or clear so pigment is added to absorb certain frequencies of light and give it a color. When crazing occurs the addition of variously sized holes reduces the refractive index of the stressed area, causing it to scatter and reflect all visible light wavelengths. This makes it appear white despite the presence of added pigment. It is interesting to note that if all the holes were the same diameter and spaced just right, you could make the surface appear any color you want. 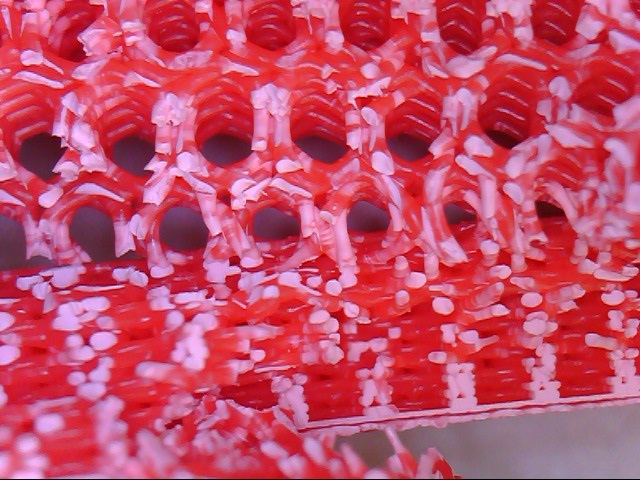 Let’s have a closer look at that red 3D printed disc. (~400X) Crazing occurs on too small a scale to observe directly without an SEM microscope. Why does the amount of whitened area vary so much? 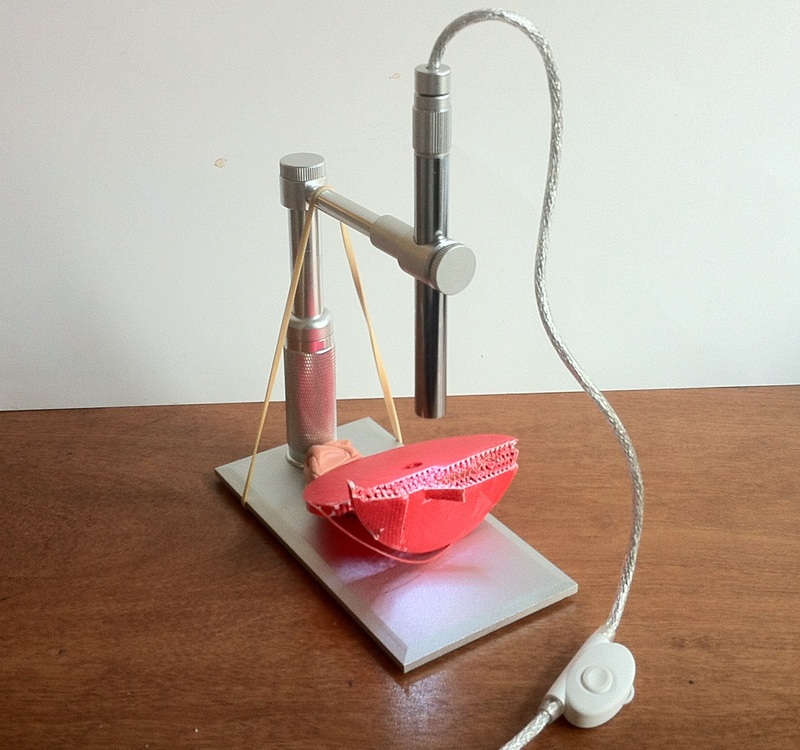 Mechanical properties of plastics vary greatly with temperature and strain rate. At high strain rates and low temperatures polymers are brittle because there is less time for the molecules to yield to accommodate the load. Less yielding means less whitening. 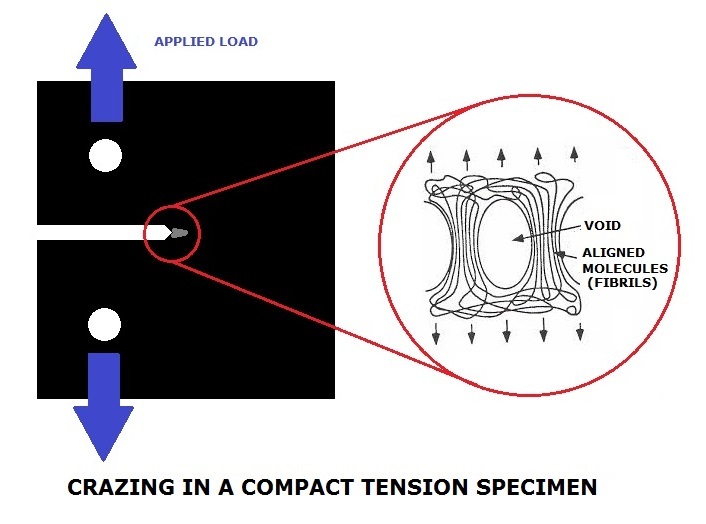 Rapid forced motion also causes internal friction, so a higher stress is required to deform the material. Plastics become measurably stronger as loads are applied more quickly. This is called strain rate sensitivity. 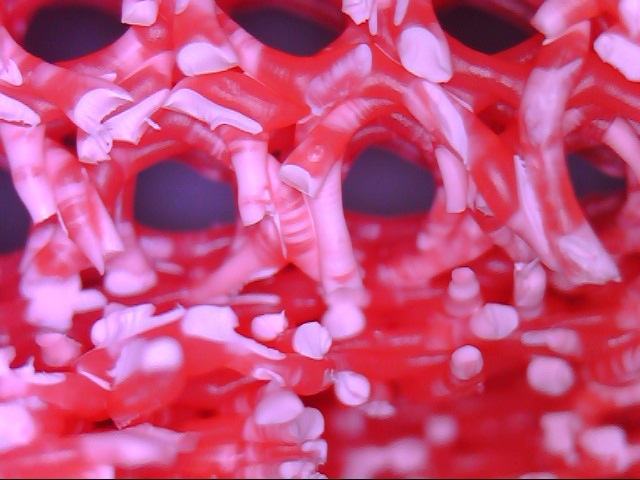 Some silicone polymers behave really weird when the strain rate is varied. Strain rate sensitivity works the other way too. When given time to comply, plastics will slowly deform in the presence of very small loads. This is called plastic creep. To some extent plastics can recover from small creep deformations given time, but not if they have started to turn white. That’s not to say that stress whitened regions are completely irreparable. Thermoplastics, by definition, can be remelted any number of times without harm to the structure of the plastic. So all it takes is the proper application of heat to fix it. Too often I see people try to repair toys or motorcycle body panels with a heat gun or hair dryer. 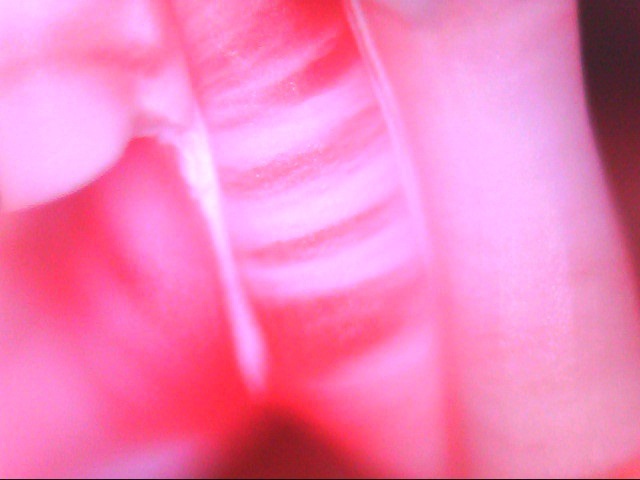 The problem is that those don’t distribute heat very well and usually leave some areas visibly distorted. (~80X) The same area after submerging in boiling water for 30 sec. 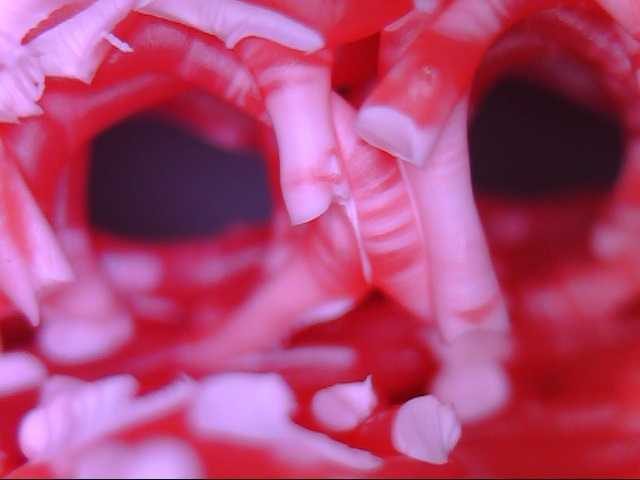 Just for fun I used my new microscope and Testrbot to make a video showing the whitened areas appear in real time. All plastics are polymers, but not all polymers are plastics. Typical engineering polymers are made of very long chains of molecules. Each chain contains thousands of repeating blocks of ‘monomers’, which are simple molecular building blocks such as elements and organic compounds. All plastics are either ‘thermoplastic’ or ‘thermosetting’1. 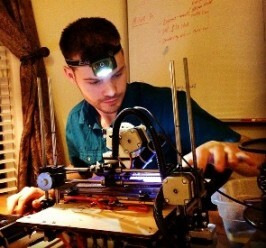 Household FDM type 3D printers only use thermoplastics, which do not undergo chemical changes when heated and can be molded again and again, just like wax. Alternatively, thermoset plastics are more like cooked eggs in that the chemical reaction is irreversible. Common examples are adhesives and insulating foams. Plastics are also classified by how their molecular chains are structured. 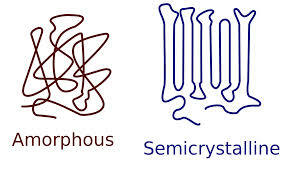 They can be Crystalline, Amorphous, or some degree in between. Amorphous structures are like a pile of super long spaghetti and they appear transparent/translucent (aka ‘glassy’) due to this disorder. A crystalline structure is just the opposite, with its chains packed in an orderly way resulting in a higher density that will not let light penetrate (opaque). 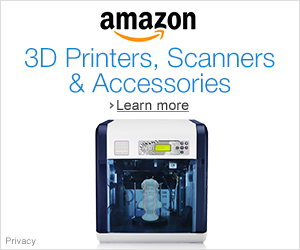 The common 3D printing material ABS is naturally 100% amorphous, while PLA is ~37% crystalline. Well that’s all for today, hope you enjoyed it! Note there are all kinds of subcategories of plastics and not all of them turn white under stress. Next Why I’m sick of sitting at work and what I did about it. You said “Natural plastics are often whitish (such as semi-crystalline PLA) or clear (such as amorphous ABS” however in my experience natural PLA is actually clear and transparent. Natural ABS is white or cream and only slightly translucent. I understand clear transparent ABS does exist but certainly isn’t the norm. Interesting, thanks for commenting, I’ll have to look into this again when I get the chance!